Kilmarnock have expressed “disappointment” at having to play Rangers for the third time at Ibrox after the split. The Ayrshire side have already travelled to Govan twice in the Ladbrokes Premiership this season and learned they will go again on Saturday, May 5 when the remaining five fixtures were revealed on Wednesday afternoon. The Rugby Park club issued a statement which read: “Kilmarnock Football Club wishes to express its disappointment following the publication of the Scottish Premiership post-split fixtures. “As has already been alluded to there is always the possibility of an imbalance of home and away fixtures. 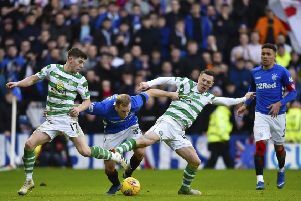 “This year we see a relative balance being struck with the reallocation of additional home matches to another team in the league, which ultimately results in Kilmarnock FC facing three trips to Ibrox with Rangers having made only one trip to Rugby Park. “While we share the frustration of our supporters at this outcome, we hope you will continue to provide the magnificent backing you have shown to our team over the course of the season. “The connection between the club and supporters has been a critical factor to our upturn in fortunes. “While an additional visit by Rangers would naturally provide a boost in terms of income, the passion, ambition and focus of everyone at the club remains on continuing to grow our home crowds. “Your strong vocal backing of the team has seen Rugby Park rocking and made our home a place our opponents respect once again.